Sonderpreise für alle unserte Lagergeräte. Teilweise Demogeräte mit leichten Gebrauchsspuren. Reduzierte Garantie von 6 Monaten nach Lieferdatum. Akkus könnten etwas reduzierte Kapazität aufweisen. 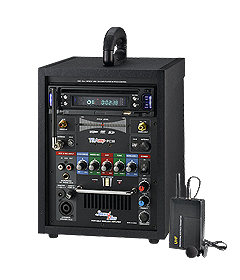 Portable wireless amplification solution of RMS 80-Watt with USB/SD-Card player suitable for MP3, WMA file format. 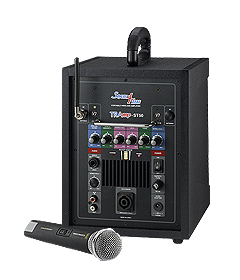 UHF or VHF wireless microphones come with music over-ride feature and digital echo function. 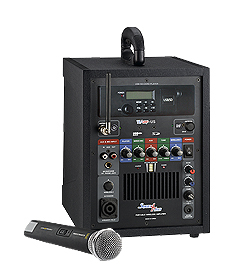 Compact All-in-One system combination of power amplifier, wired & wireless microphone, speaker, rechargeable battery and media player. Operation of amplifier by external battery (DC12V/7Ah), i.e., Vehicle battery, etc. Battery monitoring indicator by 5 array LED showing the battery level. 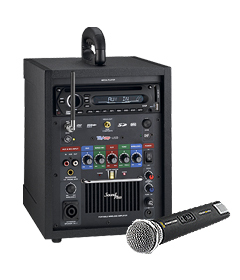 Unit can be mounted on a tripod loudspeaker stand or remain free-standing. It is easy for you to count out how long your SD memory card could record. PLL Synthesized 16-selectable frequencies. CPU operation. Noise-lock and long operational distance without signal dropout. Excellent frequency response with stable performance. 5-step array LED indicator shows the level of remaining internal re-chargeable battery by means of any number of LED light so that end-user can identify the remaining battery level and judge the corresponding time to recharge the battery. When the battery needs to immediate recharge, the last step LED starts to flash in order to visually warn the dangerous level of battery. 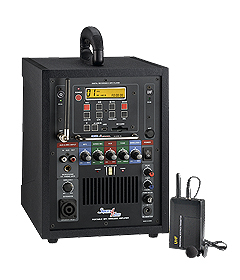 All Soundplus amplifiers are armed with ABMR which continuously monitors the battery and automatically turns off the amplifier if voltage drops to a dangerous level. But system can instantly recover by switching on the supplied AC/DC adapter. Voice-over Adjustable 0 ~ 100% / 0 ~ max. 1.5 sec.